With tech successes like Xero, Trade Me and Datacom coming out the capital, Wellington has recently been dubbed the High Tech Capital of New Zealand. But Wellington’s biggest rival in all things professional, musical, sporting, tech and otherwise – Auckland – is carving a niche for itself as a Pacific IT innovation hub. Auckland’s IT sector has grown 80 percent in the last decade with more than 6,700 companies employing nearly 31,000 people and contributing 55 percent of New Zealand’s GDP for the sector. “If population trends are anything to go by, Auckland is growing and with no sign of slowing,” observes Martin Barry, Auckland based Director, Absolute IT. Currently supporting a third of New Zealand’s total population at 1.5million, Barry says the Supercity is backed by a 30-year plan supporting an expected population growth of an additional one million by 2040. “This future-focus for the city is great for the IT sector, which is already growing,” Barry adds. According to Absolute IT’s latest Tech Employer Insight Report, 75 percent of Auckland IT employers are planning to recruit additional staff / contractors in the coming year, with the majority of the hiring taking place to support new projects and increased customer demand. Auckland is home to industry hotshots like Microsoft, Oracle, Fuji Xerox, Sharp, Huawei, IBM, Dell, HP, Vodafone, Cisco, and many more. But for Barry, the most exciting thing for the IT scene in Auckland is the emergence of local success stories like Mako Networks, konnect net, Booktrack, Vend, Wynyard Group, Endace, and TranscribeMe. 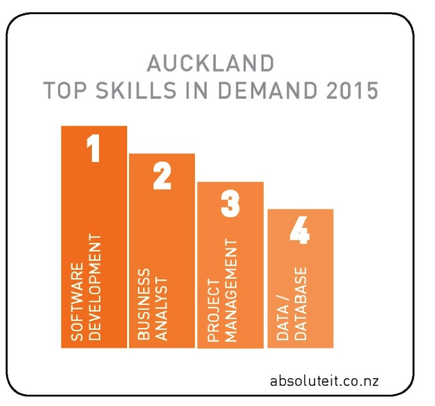 “With industry leads making their home in Auckland, IT skills are in hot demand,” he says. According to recent findings, network, infrastructure and testing have been pushed out of the top four, making way for the bourgeoning areas of project management and data/database.